The Association produce a quarterly magazine widely known as the ‘Grey Mag’. It is available through our Member Clubs across the world. 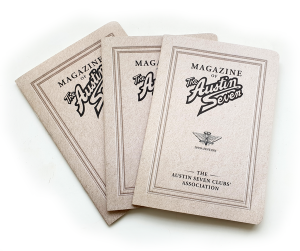 It includes a range of both technical reports and historical articles all of interest of the Austin 7 enthusiast. The Editor’s contact details can be found on the Committee and Officers page. Thanks to the work of Ron Hayhurst and John Fitch an index has been created for the A7CA Grey Magazine dating from 1990A edition to the 2015D edition. These can be found via the following download links. There is a large collection of back issues available to purchase to complete your collection. Please look at our Committee and Officers page and contact our ‘Back Issues’ officer who will be able to assist you.